Today I thought I’d share a few layouts I designed for my “Time Travel” article in the Spring issue of Canadian Scrapbooker magazine. 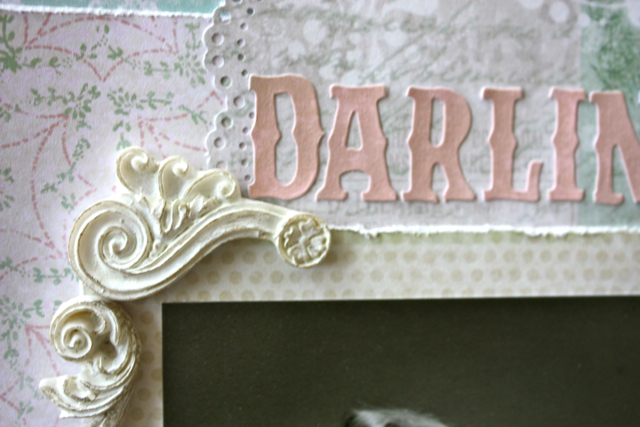 Creating heritage pages and vintage designs is one of my favourite styles of scrapbooking. 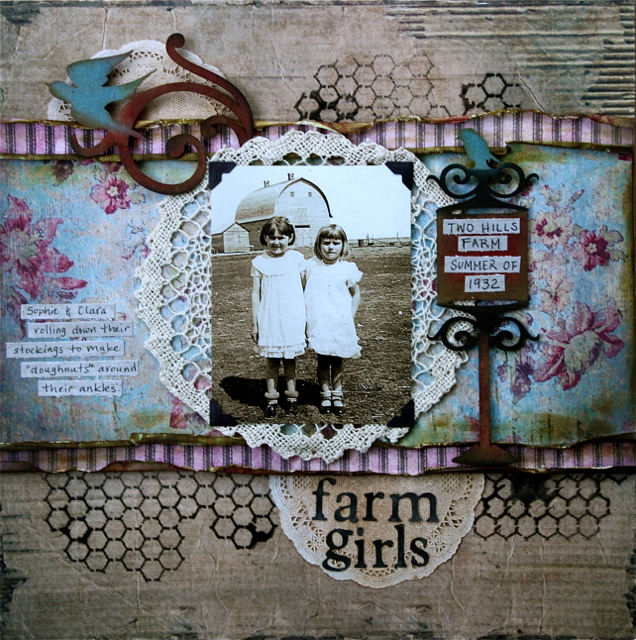 FabScraps was perfect to use for this layout “Farm Girls,” featuring a photo of my mom and her cousin in the farm yard. Why are they wearing pretty white dresses and playing outside?? It’s probably Sunday! 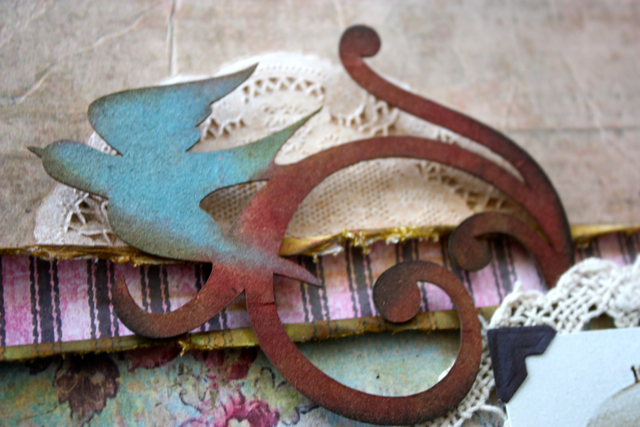 I used The Crafter’s Workshop chicken wire stencil and Stephanie Barnard/Clearsnap black spray on the background paper. The title was cut with a Cricut. 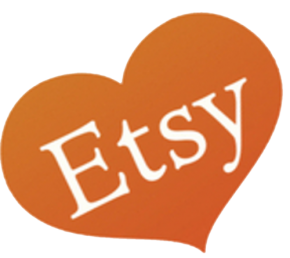 The crocheted doily was bought at a garage sale last summer. I coloured the chipboard elements with inks. 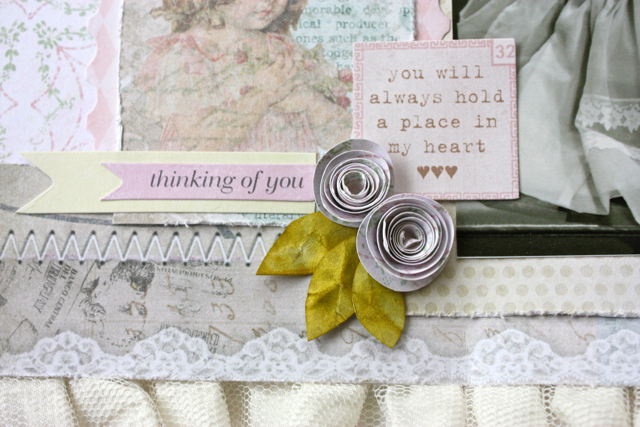 My next layout is made with beautiful Melissa Frances products…. The photo is my cousin Cindy who grew up on the same farm as my mom did! 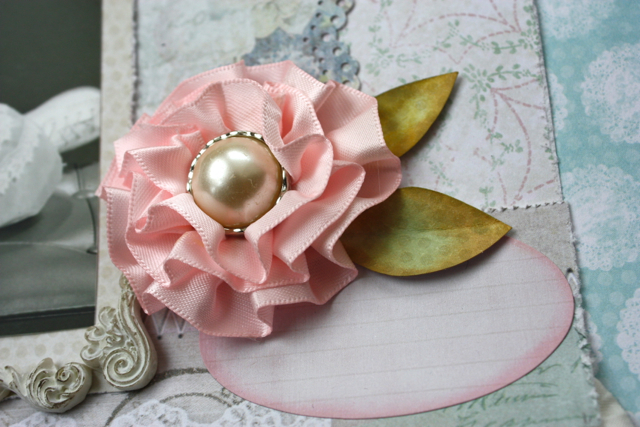 To make this flower, I just covered a chipboard circle with liquid adhesive and wound the ribbon around. Then I added a pretty pearl bling centre. The alphabet stickers and white resin pieces are also Melissa Frances. 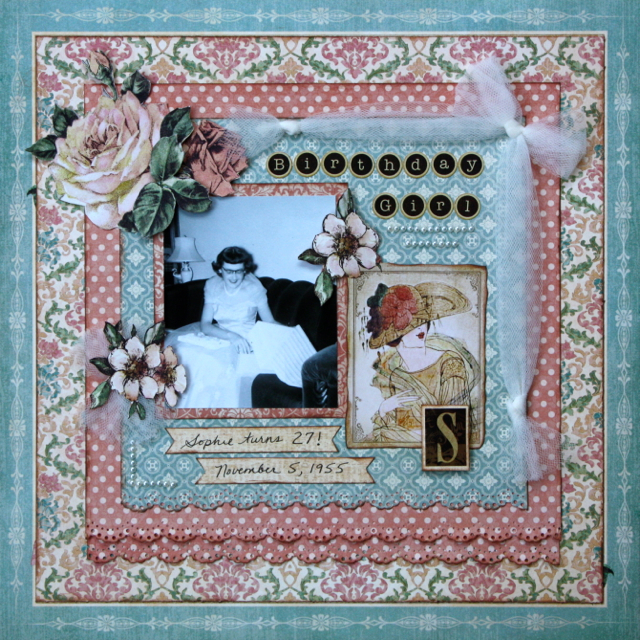 This last layout was designed with the gorgeous Graphic 45 “A Ladies Diary” collection…. My mom’s 27th birthday! Love her dress. 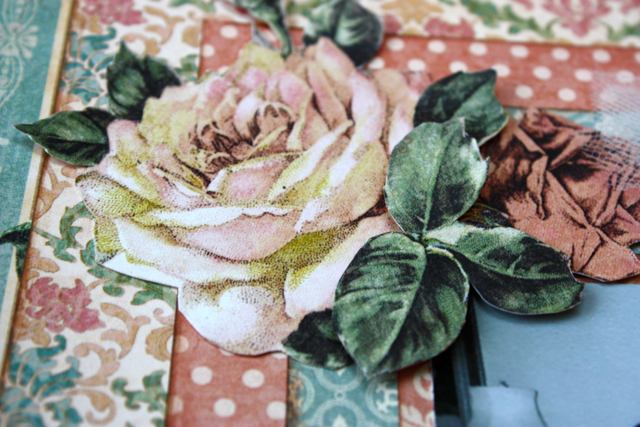 I fussy cut these roses and leaves from the patterned paper. 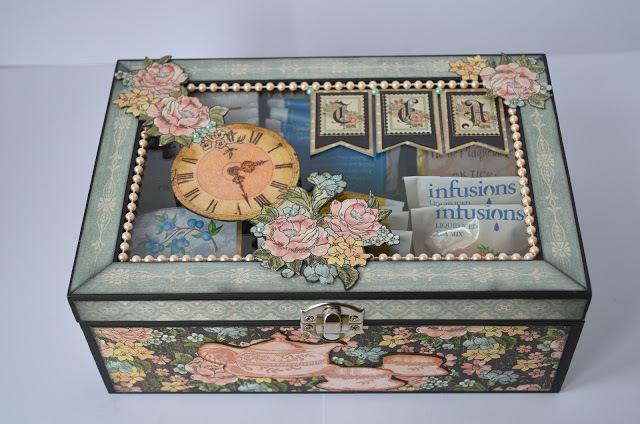 A very sweet friend of mine, Michelle Marks, also used Ladies Diary and designed this gorgeous vintage tea box and mailed it to me for my birthday…. 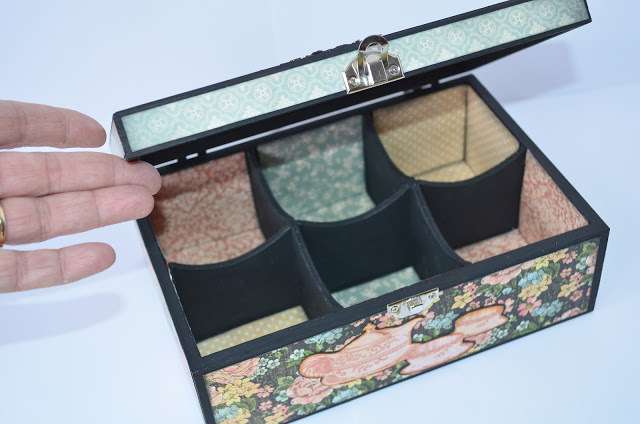 Click HERE to visit Michelle’s blog and see a tutorial on how to make this tea box. I love it, Michelle! Thank you so much. My heritage pages are precious to me, and I really enjoy sharing them with all of you. « More news is GOOD news! Love your work Kelly. So beautiful! Beautiful layouts! I just love all the heritage photos! So precious to scrap! 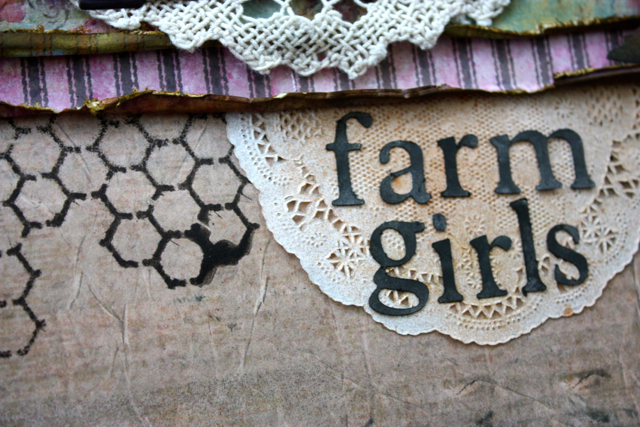 I love the Farm Girls photo, all the layouts and your Mom’s glasses! Great job Kelly! I love them all! You do vintage SO VERY WELL! I think I’ll send you all my pics and let you work through them! Sound like a plan???? You are amazing at heritage layouts Kelly. I love all your designs and you can tell the photos are very special to you. I’m glad you have them to scrap. Beautiful projects.. each and every one! Kelly you make beautiful heritage pages! What amazing photos and history you hold in your hands…my favorite is the 1st…there’s something about the sweet photo, the gorgeous colors and wonderful design! Congrats on the published works you!! wow Kelly fantastic!! love all of these!! just gorgeous display of projects!! These are beautiful heritage layouts. Congrats on your success, my talented friend! These are great lo’s Kelly! 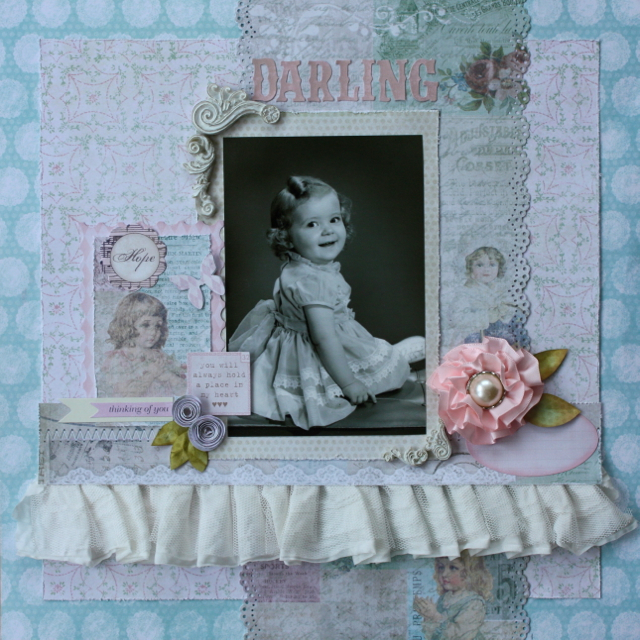 I love that you create with old vintage photos – they truly mean so much! Happy belated birthday, Kelly! Your friend made you the most amazing gift – the kind from her heart. I love all three of your layouts. The first one is so beautiful, and the photo of your mom and her cousin is a real treasure. You made it even more of a treasure by scrapping it to perfection. What a fun title. Your second page – well – it’s just fabulous. I am loving that photo of your cousin – such a cutie pie! You used these products to perfection. And your third layout of your mom is totally fabulous. I love her dress, too. So pretty. I wish our mom’s had saved more of their old clothes. You used the graphic 45 collection beautifully. Thanks for sharing your creations with us, Kelly! These are all so beautiful! I didn’t even notice the “donut rings” until you mentioned it and it gave me a giggle! I love your heritage layouts!!! Oh they ARE precious. I love how soft and romantic and just … BeauTifuL they are. 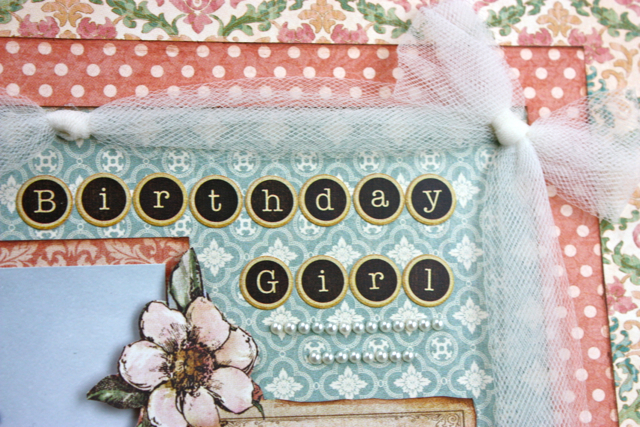 Congrats on your gig with Canadian Scrapbooker! 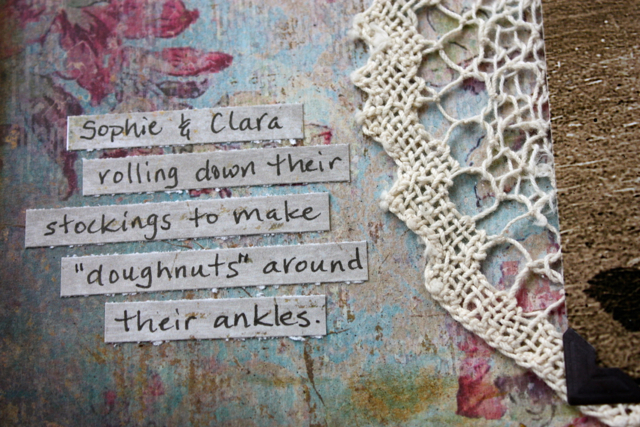 And it’s so cool…my granddaughter’s names are Sophia and Claire! You are the queen of vintage Los Kelly! I am sooo envious of you having all these lovely old photos to play with! I love that pink spiral flower on the ” Darling ” Lo.It is so feminine and fits this Lo to a T !The found doily adss such a lovely homespun vintage touch to your Farm girls Lo …and I got a giggle from that donut thing with the socks ! lol…and you’re welcome for the birthday present!!! I loved making it for you and am looking forward to sharing lots of tea in your kitchen again this fall! How did I pass by these marvels. WOW. It is such a treat to come to your blog, Kelly. I learn something new every time. You are doing such beautiful heritage work. The tea box is especially divine. Oh, I need to read more closely. The tea box is indeed divine and a big shout out to Michelle on her handiwork. All of your own handiwork is of course top notch!